Hope everyone had a fantabulous weekend! I got in my new furniture I talked about earlier from the store that was closing. It’s so wonderful. SOO spacious. I’ll show it off the day I get everything all put in it’s place and such. 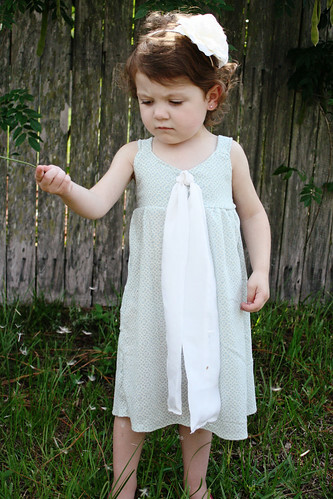 Onto another goal for the summer: Make one dress a week for my daughter. This is week one. Couldn’t get her to pose for me much, but she’s still a cutie! I love the dress on her. I drafted the pattern myself and is actually a variation for a pattern I almost have all finished to send to pattern testers. The headband is from Forever 21 (only like 2 something dollars! LOVE IT!). We went there one day last week and she picked it out and danced the entire time we were in the store. If you have been in there, you know they can blast some music. She provided some good entertainment for the employees. The headband went perfectly with the dress. I’m trying to come up with something for next week…… Off to dream and create now……. That’s an awesome goal and the dress is darling! I’d love to test for you! Darling dress! 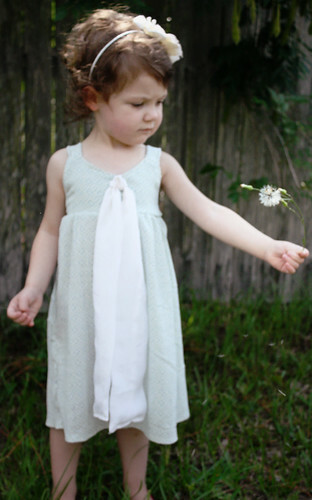 I have a daughter who would look adorable in that if you’re up for adding me to your pattern testing list. I’d love an excuse to make something for her. awwwwwwwwwww…she looks darling. 🙂 well done. Oh isn’t she precious!! You make me jealous of having a little girl to dress up! Beautiful! What a neat goal. Cute dress! and love the headband. It’s so simple and gorgeous! I love the color and the clean lines. You did great! Cute! And I am not sure if I’m on your list as a pattern tester, but you can use me if you want! Love her outfit — is she always that adorable? can she be any cuter! Ohh.She is very scowling and very sweet.And the dress is very beautiful.